I've run this half marathon twice so far : once last year with a 2:01 and this year with a 1:52. OK fine, this year was a 1:52:58 so rounding up was a 1:53. Here are some race highlights. Firstly, the race is in San Francisco (SF or just The City). Not only do you get an excuse if you don't already live in SF to explore the many restaurants, bars, cafes, parks, tourist traps but you get to run in The Golden Gate Park (The Park). Secondly, well there is the Firstly. Last year the weather was perfect for racing with very slight breeze and cool ~58 deg by the ocean. This year, a drought year, it had not rained the entire year ... except on Sunday morning race day. In fact, not only did it start raining as soon as the shuttle bus came to pick us up from The Kabuki Hotel at 6:30AM but it was cold ~45 deg and windy. Yuck. Luckily, we had gone out the night before to a very nice bar/restaurant called Umami on Webster off Union Street and enjoyed VERY nice Happy Hour 'bar' food. I say 'bar' food with tongue against cheek because this is no ordinary bar food. The Kobe beef 'sliders' are very tender and juicy. The stack of ribs were just perfectly spicy and tangy. And we had several sushi rolls. IF you get there when they open at 5:30PM (highly recommended and/or get a reservation) and order before 6:30PM the prices are excellent. So, we sat on the bus for the ~20min ride to The Park looking out at the gloom but with fresh memories of a nice diner to keep our spirits up. As soon as we exited the bus we were met with a nice cold wind and rain. The Park was actually beautiful with a raging water fall by Stow Lake, very green which is in contrast to the rest of the State of California but there were puddles everywhere and muddy if you dared to go off path. Many made a dash for it to an overpass to get some shelter from the rain and they were also rewarded with a kind volunteer handing out transparent garbage bags! Was never soo happy to see a garbage bag. And yes I forgot to being my garbage bag but I did have my sweat-check bag already prelabeled with my bib number in permanent ink I was half prepared. All decked out in garbage bags and huddled under the one umbrella we meandered towards the start area. I missed the 7:30AM group KP-IT group photo, did hit the porta potties then tossed the soggy '2014 SF Marathon Ambassadors Meetup' poster with runny ink to huddle near the start. Last year in the nice weather there were long lines for the porta-potties and it was hard to get up near the start. Not this year. There was plenty of space up until about 10min prior to the start of the race. One nice thing about rainy, cold weather was no one wanted to leave their warm, dry cubbie holes against the elements to stand by the start. The 8 min/mile section was all MINE! We are off, warming up against the chill, birds are chirping, brook is babbling, having a nice chat with a fellow runner then WHAM. At approximately mile 3 as we came around a turn I was running on the flat part of the center road divider and didn't see the slick manhole cover. Down I went towards towards the left, right palm out first (don't do that), right knee, roll on my waist belt/water bottle then back up again to the ohhs/ahhs of the crowd. One racer yelled 'Do it again' and one simply clapped. I don't remember any of it and in fact felt absolutely nothing .. until the next morning. One other funny difference between last year and this year was 'ole faithful'. Very close so the turn around by the Zoo there was another manhole cover (starting to not like manhole covers), but this one was spewing warm sewer gas 20 feet into the air every few seconds. The smart racers adjusted their pace to not get a very unpleasant burst of gas. The unaware were in for a surprise. Sorry, no photos. The rest of the race was uneventful. I saw a few familiar faces, plenty of high fives and 'finish strong' both going and coming back from the turn around. Fellow runners are great. As soon as I realized I was going to PR over my time from the Inaugural Berkeley Half Marathon race, a huge smile developed across my face; especially, given the challenging weather, etc. KP decided NOT to present finisher medals which many runners were upset by. To be honest, I still have my finishers medal from last year so wasn't terribly upset to not get one this year. 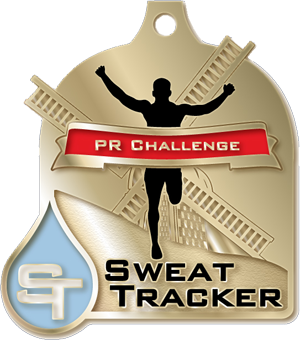 However, one of race sponsors, SweatTracker, had a PR challenge that IF you beat your best half marathon time they would give you a medal at the finish's area. Sure enough after I passed under the finisher gate and headed over to their booth there was someone from said company with a smartphone checking results and 'PRESTO' PR bling. I'm actually more proud of my hard won PR challenge than I would have been from 'just' a finishers medal. Post race was a nice walk down finishers alley then some hot chocolate/pretzels and an IPA (in that order) at Beach Chalet. I was able to meet up with some fellow IT folks from work and finally with one of the 2014 SF Marathon Sponsors!! Was a great race after all.